ISBN 9781854724540. 9 x 12 inches. 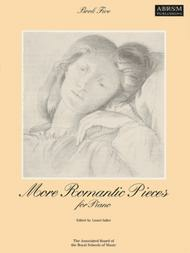 These five volumes of piano repertoire offer an ideal introduction to music from the Romantic period. Featuring works by great names such as Chopin, Schumann and Debussy as well as pieces by lesser-known composers from this prolific period of piano writing. Volumes are carefully graded and offer a variety of keys time signatures and moods, and provides invaluable practice and concert repertoire through the grades. "Lesson in E, Op. 33 No. 9" Performed by "Bennett, W. Sterndale"
"Sleepless Nights (Nuits Blanches), Op. 82 No. 7" Performed by "Heller, S."